Even the casual listener knows that the music business has been in a state of turmoil since the turn of the century. Decimated by piracy and services like Napster, record companies tried to adapt, first by selling mp3s and then finally agreeing to join forces with commercial streaming services like Spotify and Apple Music. Those services represent an ever-growing portion of revenue for labels and artists, but one big problem remains - they fail to make up for the loss of income due to declining CD sales. Fortunately, there are a number of new technologies that will bring major changes - and significant financial gains - to the music business. The first is virtual reality (VR). A small handful of musicians are already using VR, either as part of a performance or to promote a single , much like a traditional music video. Artists are also starting to live stream concerts in VR, allowing fans from all over the world to share in experiences. While these streams will probably never supplant the experience of seeing a band live, in person, they open up a new world to people who lack the financial means to see live music; people who live in underserved markets; and people with disabilities who face high barriers to entry at many music venues. Beyond simply streaming concerts, artists can also create interactive virtual worlds where fans can spend a day. This could be a fantastic tool for education or simply for fun; there is room for experiences that both showcase the hardships of Saudi musicians who are not allowed to play in public and also the joys of being a pop star on stage in front of adoring fans. Artists can also potentially sell merchandise in the VR experience, creating another source of revenue. Artificial intelligence (AI) also has broad implications for musicians. A startup called Jukedeck , based in London, uses algorithms to create songs for users, mostly individuals or small brands looking for background music for video slideshows who don’t want to pay royalty fees to use existing music. While it’s unlikely that robots will ever replace pop stars fully, Jukedeck’s product could improve to the point that larger brands and stores use it rather than licensing music, and that would represent a major loss of income for many artists. On the upside, AI could help producers and artists with some of the grunt work of composition and let them focus more on being creative. The rise of the blockchain and bitcoin could also be game-changing for artists. Right now, the data associated with many compositions is incorrect or out-of-date - and if streaming services don’t know who owns a song, they can’t pay them. Some experts have suggested that the blockchain might be a solution to this; if artists can upload correct data and payment information to a secure and open-source platform, payouts will be more accurate and some smaller artists could make more money. Other artists are already experimenting with accepting bitcoin as a method of payment, and as the crypto-currency becomes more popular, that trend should accelerate. The music business has been through a number of changes in the last fifteen years, and has often found itself at odds with emerging technology. 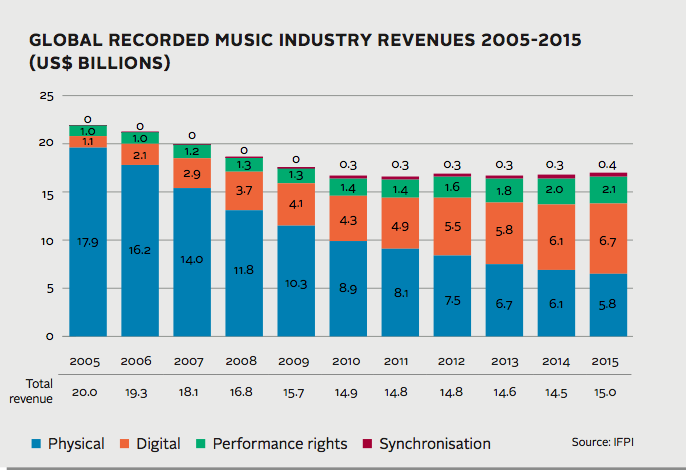 If it wants to survive until 2030, however, it needs to embrace new methods of sharing, creating, and selling music. Have you read? These are the top 10 emerging technologies of 2016 What if: our virtual life overtakes our physical reality?